Calvin Lee, principal and creative director of Mayhem Studios, interviewed by Sharebrain for their monthly column, Braintalk: 15 Answers. Where designers are asked the same 15 questions, but with 15 very different insightful answers into their process, inspiration and daily lives. 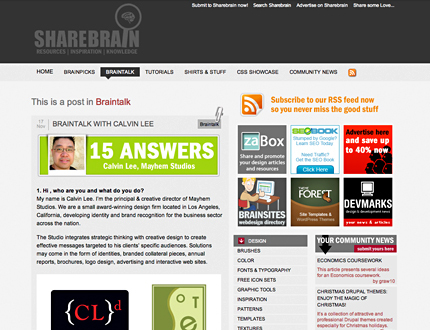 Head on over to Sharebrain and read the interview, Braintalk: 15 Answers with Calvin Lee. Hope everyone will find the interview helpful and inspiring.